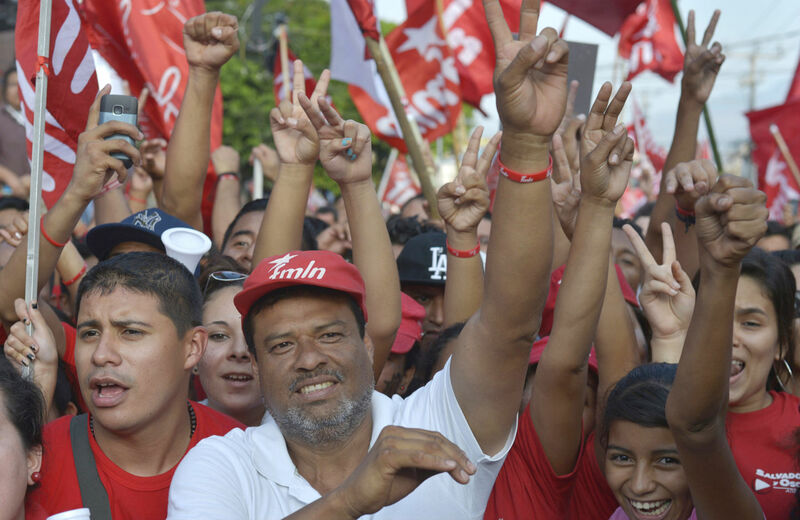 The vote marks a hard-fought victory for the FMLN’s ambitious economic agenda, which has included a host of new social programs that have improved education and healthcare for millions of Salvadorans. But right-wing forces vigorously disputed the election—one that the Organization of American States called the most transparent in El Salvador’s history—and conditions imposed by Washington are threatening to undermine the country’s gains. While the US embassy officially maintained a neutral stance in the election, Washington is threatening to withhold development aid unless El Salvador adopts economic policies that are anathema to the ruling coalition of left and center forces that have been working together over the past five years. That threat could end up undermining the very programs that contributed to the FMLN victory in the March 9 poll. Since taking power in 2009, the FMLN—a former guerrilla movement that became a political party in the early 1990s—has ushered in a host of popular social programs designed to improve living standards in El Salvador, where over a third of the population lives in poverty. Before stepping down as minister of education to run for the presidency, FMLN president-elect Salvador Sánchez Cerén started a literacy program that reduced adult illiteracy from 18 percent in 2009 to 13 percent in 2012. The program, part of a broader push to make education accessible to all Salvadorans, functions on a $2 million budget and enjoys the support of over 40,000 volunteers. Other reforms include free school uniforms and a glass of milk every day for schoolchildren. Since 2009, the FMLN has been responsible for the implementation of a healthcare program that includes primary clinics throughout the country, regional hospitals and government funding for preventive health measures. Though healthcare has always been a right under the Salvadoran constitution, access had been restricted as part of privatization efforts—by 2006, in fact, 47 percent of Salvadorans had been pushed out of the healthcare system. Now, the Ministry of Health serves 80-85 percent of the population for free. The election also marks the first time that a former FMLN guerrilla commander has defeated a candidate from the Nationalist Republican Alliance (ARENA)—a right-wing party founded by Roberto D’Aubuisson, the father of the US-backed Salvadoran death squads. The two parties were the main opponents in El Salvador’s civil war (1980-1992) and have been the country’s principal political parties since the 1992 peace accords. Sánchez Cerén’s victory suggests that the FMLN’s social programs and community organizing helped the party overcome the fear-based ARENA propaganda that was broadcast by the country’s right-wing-dominated media. In the run-up to the election, the Salvadoran Election Tribunal (TSE) quadrupled the number of voting centers, removed at least 50,000 deceased Salvadorans from the voter rolls and ensured that poll workers live close to voting centers, making it easier for them to identify fraudulent voters. These elections also marked the first time Salvadorans outside the country, who comprise over a third of the total population, have been able to vote. Yet in response to his electoral defeat, ARENA candidate Norman Quijano cried fraud, pushing back the official announcement of a winner by the TSE by several days. Quijano, who had previously declared victory with only 70 percent of votes counted, subsequently called on the Salvadoran military to “implement democracy,” adding ominously that ARENA was prepared for war. With a bloody civil war at the center of the country’s recent history, ARENA’s willingness to call upon the military to intervene is highly concerning. But David Munguía Payés, the minister of defense, rejected Quijano’s request, maintaining that the armed forces are “committed to respecting the electoral results issued by the Salvadoran Election Tribunal.” Days later, the TSE rejected ARENA’s demand to nullify the results and declared Sánchez Cerén the winner. In the past, the United States has given the Salvadoran oligarchy considerable support, including $6 billion in direct military assistance and training for the armed forces during the war. Though in recent years US intervention in Latin America has been less flagrant, Washington’s support for military interference in the region has continued. In 2009, when soldiers forced Honduran President Manuel Zelaya onto a plane to Costa Rica while still in his pajamas, the United States was the only country in the Americas not to classify the incident as a coup, allowing economic and military aid to Honduras to continue. The use of US foreign aid to exert control over the Americas is worrying for left-leaning governments in the region, especially as institutions such as the National Endowment for Democracy—which financed the protests that sparked the attempted coup against former Venezuelan President Hugo Chávez in 2002—continue to funnel money into similar projects, such as funding the party of Venezuelan opposition leader Leopoldo López. With Sánchez Cerén already likened to the late Chávez in much of the Salvadoran media, it will be difficult for the president-elect to continue the programs he was voted in to protect without fear of reprisal from the United States. By threatening to withhold foreign aid, the United States coerced El Salvador into enacting last year’s Public-Private Partnership law, which privatizes public services and assets to a degree that would cause an uproar if it were attempted in the United States. The law, an initiative of El Salvador’s bilateral trade agreement with the United States, was written by US Treasury Department advisers with the IMF, World Bank and the outgoing administration of President Mauricio Funes. The proposed partnership was unveiled in November 2011 during a visit by Barack Obama. Unable to stop the passage of the Public-Private Partnership, the FMLN bloc in the legislature voted for a revised version of the law that stopped the privatization of water, higher education, and healthcare. Now, US Ambassador to El Salvador Mari Carmen Aponte is making the privatization of these sectors a prerequisite for further funding from the Millennium Challenge Corporation, a US agency that provides foreign assistance on a competitive basis. After a close election, it will be difficult for the FMLN to forgo the Millennium Challenge Corporation money. When the Salvadoran people voted for the FMLN, they were voting for a platform of increased social programs and community control. The Public-Private Partnership foisted on the country by Washington could put these goals out of reach. With the US government leaning on El Salvador to accept a privatization package that would never be accepted in the United States—and the tenets of which were rejected by Salvadoran voters themselves—it appears that Washington still isn’t ready to let democracy flourish in Latin America. Madeleine ConwayMadeleine Conway has previously written about the Salvadoran National Literacy Program and is currently working on a documentary about indigenous women leaders in Colombia.